My father, Glen S. Furse, was a radioman on the WeeVee after she was refloated. He has shared many memories with us, his children, while we were growing up. This helped to imbue a sense of patriotism in all ofus. Glen Saunders Furse, Radioman 3/c, born Sept. 15, 1925, West Jordan, UT. 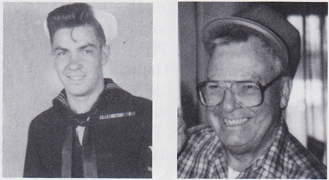 He joined the USN May 31, 1943, and served in USS West Virginia. The Virginia served as the flagship of Battleship Div. Four and he was transferred Adm. I.C. Sowell's staff May 31, 1945. Basic training and Radio School at USNTS Farragut, ID. He participated in invasion of Leyte Island, Philippines; Battle of Leyte Gulf; invasion of Luzon, Mindoro, Iwo Jima and Okinawa. His battle station was 20mm anti-aircraft gun and main radio shack. Discharged March 16, 1946. Awards include WWII Victory Medal, American Defense Service Medal w/clasp, American Campaign Medal, Asiatic-Pacific Campaign Medal w/4 Battle Stars, National Defense Service Medal, Philippine Liberation Ribbon w/2 Battle Stars and Philippine Presidential Unit Citation. Employed with US Civil Service as management analyst until his retirement. He has a fabulous wife, six children, 18 grandchildren, three great-grandchildren and more to come.